Superman and DC Comics have found themselves on the receiving end of some bad PR this month due to their release of the Wal-Mart exclusive Superman 100 Page Giant issue #7. The controversy about the comic book involves several panels that depict Lois Lane being repeatedly tortured to death. Insert your own “shopping in Wal-Mart is already torturous enough…” joke here. Remember the Pringles can wine drinking lady? These horrible events are not happening for real however. Superman’s imagination is running wild while he is in a waiting room and he is visualizing several worst case scenarios for Lois. The imagery is pretty graphic and includes her being shot in the head and burning alive. These images have a number of parents up in arms as the entire line of Wal-Mart exclusive comic books are intended to be entry-level, kid-friendly comic books. They are marketed on shelves with Pokemon cards and coloring books. With all the negative attention and rumors of DC possibly recalling the book (which I extremely doubt would happen), the speculation buyers have been gobbling these issues up as if it were 1992 all over again! Remember when we thought this issue was going to pay for our kid’s college education? But it also got me thinking about what other Superman comic book controversies there have been. Since the toddler went to bed a little early tonight, I got bored and decided to make a list! In The Last Son of Krypton‘s defense, this was printed during World War II after the Japanese Imperial Navy surprise attacked the United States Naval base in Pearl Harbor killing over 2,400 people. Outrage against the Japanese was all over the country and national patriotism had never been (and probably never has been since) higher. Superman was trying to do his part by selling war bonds and seeing drawings of Japanese soldiers with the glasses and buck teeth were not exclusive to DC comic books. Still, the idea that Superman could give out permission to slap any member of a nationality may not have been controversial then, but it is now. Poor Johnny Dee. Supergirl is labeling him a “COP-OUT” right on the cover for all to see. And the editor is calling him a “BUM”! That’s gotta hurt his draft status! All because he faked an upset stomach to avoid entering the school’s big game. In his defense, the mob kidnapped his main squeeze and threatened to kill her if he didn’t throw the game. They even had multiple snipers around the stadium to shoot him if he entered the game! The mafioso of Metropolis takes their point spreads pretty friggin’ seriously! You know how ever once in a while you hear a story about some moron falling in love with an inmate on death row? Well, replace “some moron” in that previous sentence with “Lois Lane” and you pretty much have the plot for Superman’s Girlfriend issue 105! Convicted murdered Johnny Adonis (there are a lot of ‘Johnny’s in Metropolis) has one last wish before being given ‘the chair’: To marry Lois Lane. SHE ACCEPTED AND THEY GOT MARRIED! RIGHT IN FRONT OF SUPERMAN! Johnny had some cajones! That’s right! Superman’s girlfriend Lois Lane married a convicted murderer the day of his scheduled execution! No alternate universe or erased memories or clones here, this is canon, real-world (comic book wise) straight-up bad decision making! Of course a jailbreak happens just before the scheduled execution, other shenanigans take place and Johnny is offed by some other convicts. Meaning that loony Lois Lane is back on the market gentlemen! Keep Your Comic Books Protected With 200 Bags & Boards For Only $33.99 From Amazon.com! WHAT THE HECK WAS THIS CREATIVE TEAM THINKING!?! Granted, at the time this issue was published, the world was in a different place (racially), but come on! Lois Lane decides to live for a day in the black ghetto of Metropolis (uncreatively called Little Africa) so she finds a tanning machine that can turn her African American for a single day (does Amazon carry machines that do this?). While in Little Africa, she befriends a neighborhood activist who gets shot by drug dealers. She saves his life by giving him a blood transfusion. He wakes up and sees that she is actually white and thanks her. Pretty much a normal Thursday for Loony Lois Lane. The plot is innocent enough. Poor little Jon Ross (I told you, a lot of “Jon’s” in this town) is sick and has lost his will to live (ala Queen Amidala). He really wants to know Superman’s secret identity and Superman believes sharing his identity with the boy will somehow magically cure him. I don’t get the logic either. Superman reveals to Jon that he is mild mannered reporter Clark Kent but the boy refuses to believe him. 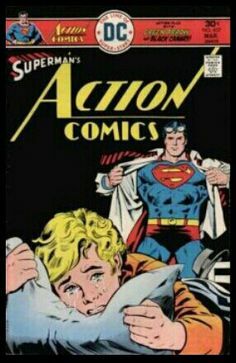 This has absolutely nothing to do with Superman, but while putting this article together I came across, what can only be described, as the worst choice for a comic book cover in the history of…well…IN HISTORY! Bonus points for whoever comes up with the best caption for The Rifleman from Dell Comics. What did you think of my list? What Superman stories would you have liked to have seen added? Comment below and let me know! Previous Zoo Will Feed Meerkats A Cockroach Named After Your Ex Live On Valentine’s Day! I am laughing so hard I am crying. What were these people thinking?! Each is more weird and razy than the last! It’s funny how nobody noticed or thought that they would be acceptable. As to the Lois Lane, check out the book Black Like Me, that’s probably what the writer and editors were thinking. I’ll look for that. Always game for a new read. Thanks.